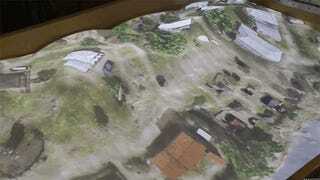 Dubbed the ARES Sandtable, this U.S. Military prototype uses a Kinect, a projector, software, and sand to recreate real-world environments like never before. Traditional sandtables can take up hours to set up, while the AREAS table might make it possible to do the same thing within minutes. 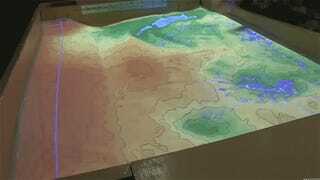 Researchers are even trying to enable networked ones, linking sandtables across the globe. "One of the advantages that AREAS has is that you're actually seeing the real 3D terrain," says Charles Amburn II from the U.S. Army Research Laboratory. "It's more realistic instead of using three-by-five cards or little markers to mark out where the units are or the terrain features are. You can actually see those terrain features." There's even a "video game view" that shows the tanks moving out across the landscape. In the Military.com video, you can see officers shaking the sand off their hands after using the table. Maybe these researchers should talk to Sega about the special sand in its arcade sandbox?